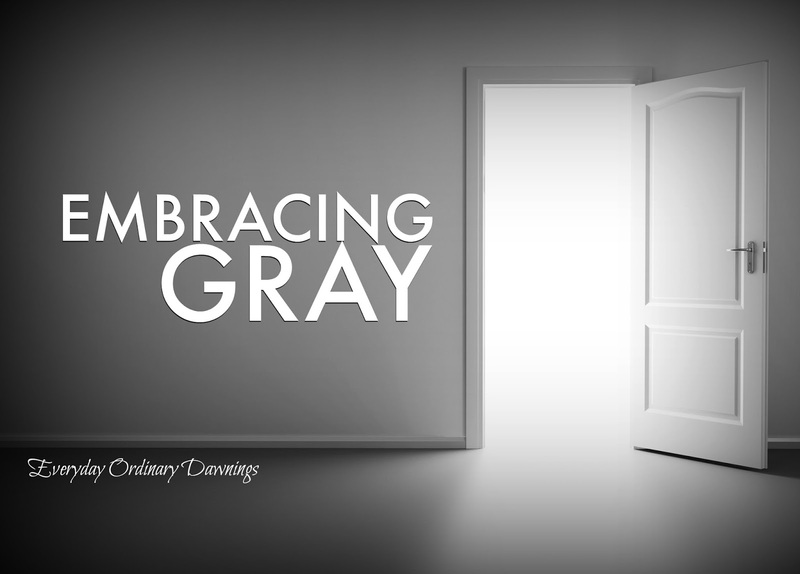 I wrote a post a few months ago called Embracing Gray. I'm still on that journey, both the physical one to gray hair as well as the spiritual one that had a fuzzy, gray start sometime last year. I'm an avid student of the word and have a deep love of scripture. I learned to speak the language of inductive study method and systematic theology in our seminary days and never looked back. Until now. Two years ago, my co-teacher of the 3-5 year-olds Sunday school class and I decided to tie all the Bible stories together into one connected narrative with our kiddos, so they wouldn't have a bunch of random Bible stories with no anchor. We pieced together our own curriculum and unfurled a roll of butcher paper around our classroom like wallpaper border to create a timeline as we studied week by week with crayons, glue, and blunt scissors. Impressive, I know, but, honestly, it was the beginning of a seismic shift for me. I just didn't know it yet. Anyway, we crafted our way through the usual simple versions of Bible stories and added them to our timeline and our larger story. I learned so much from stringing preschool stories together to create a different story that it was downright humbling. What's worse is, this was my second foray into approaching the Bible as a comprehensive narrative with one cohesive story arc. A decade previously, I read through the bible in a year for the second time in my life, and like the good Precept Bible teacher I was, noticed a recurring key phrase from beginning to end. I began marking it in Exodus and sure enough I found the phrase or any number of variations clear through to Revelation: So they will know there is a God in Israel. So you will know that I am the Lord your God. Etc. After our preschool timeline was complete, I was hungry for more, something not on the preschool level perhaps. I researched "read through" plans and audible versions of scripture, website offerings, and different approaches. As last fall approached, I toyed with the idea of asking our church's women's ministry to do it with me. I'd have everyone read on their own and meet weekly for an hour to discuss, stay on track, commiserate, and celebrate. I opened a word document to write what turned out to be a sales pitch, that touted the value of word studies and micro-study, but then introduced the concept and benefits of macro-study. Preparing that sales pitch taught me that a telescopic view is just as valuable as a microscopic view, and a full grasp of scripture is incomplete without both approaches. In hindsight the person I was trying to sell was myself. I dusted off what notes still survive from a college English class called Survey of the Bible as Literature I took long ago. I relearned from my state university course, that the Bible is written in basically three literary forms: Narrative, Poetry, and Prose, and the way to approach literature varies according to genre. Poetry's purpose isn't to teach an intellectual concept by way of reason, logic and deduction. That is the aim of biblical prose. Poetry wants us to come away from it moved, affected by all the feelings. If poetry takes us to the same destination as narrative or prose, it takes an altogether different route. Poetry's goal is to make a powerful impression through sparse language that is carefully chosen to evoke imagination and emotion. Poetry isn't conveying information as much as it is providing an experience, and narrative has its own nuances and ways of forming and informing us. 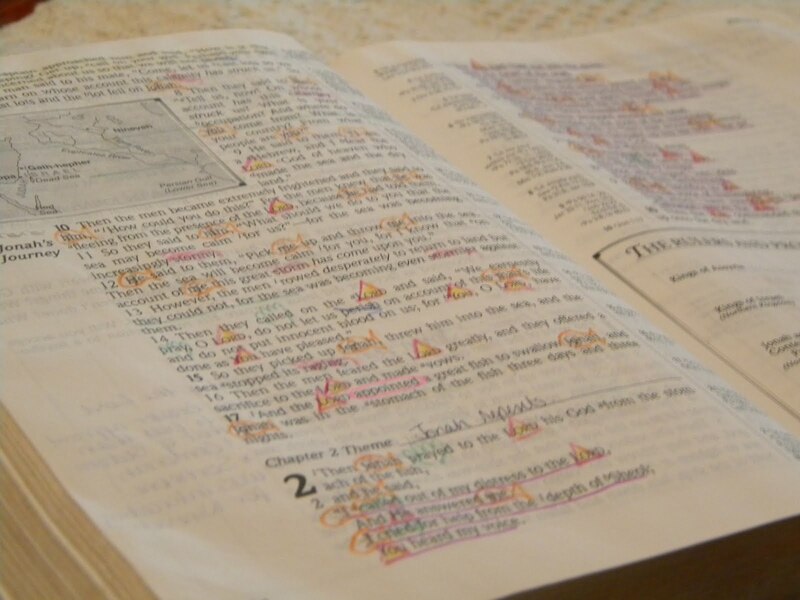 About one third of the Bible is poetry and almost half of the Bible is narrative. So all these decades I've approached 75% of God's word forcing it to be non-fiction/essay/information that I could reason out logically and apply to my life. What if I let Biblical poetry be poetry in my Christian life? How might the cadence and rhythm and parallelism of Hebrew poetry form me spiritually? How might the piquing of my imagination and the invitation to not just hear the details of Israel's story but to enter into it move me closer to feeling the heart of God, hearing its rhythmic beat? What if instead of "knowing" Jonah was in the belly of the whale, I entered that dark, dank, desperate chamber with him in Jonah's poetic prayer? And the Lord appointed a great fish to swallow Jonah, and Jonah was in the stomach of the fish three days and three nights (Jonah 1:17, narrative). I descended to the roots of the mountains. See how they aren't at all the same thing? One tells the facts, while the other invites us into Jonah's distress and dire circumstances and plunges us into darkness to feel his peril then relief that that fish has saved him in one gulp. The one gives us knowledge. The other gives us an experience that affects us in a different way than does the narrative or prose. All forms of literature can do their respective work, but they only do what they do. Poetry cannot do the work of prose. I am ready to embrace that. I'm not abandoning my systematic theology. I'm just finally expanding beyond that starting place. I'm adding to my tools for coming before the scripture and the Lord to let God mold me as he wills with it any and every way he wants to. I'm no longer interested in asking poetry to be non-fiction prose. I'd much rather approach a burning bush that isn't being consumed and take off my shoes. I want to feel the heat, know its unending intensity, danger, and mystery up close, while standing—trembling—on exposed, bare flesh. I no longer think reason and observation/interpretation/application are the only appropriate approaches for that. Perhaps the poetic passages are best received by sliding out of our shoes, wiggling our toes into the hot, hot earth and experiencing flesh that is somehow standing on holy ground and yet, merciful miracle beyond explanation, not being consumed.